It is Fourth of July weekend in Fort Myers and the fishing has been really good! This is easily one of the busiest weekends on the water in Estero Bay and Fort Myers. 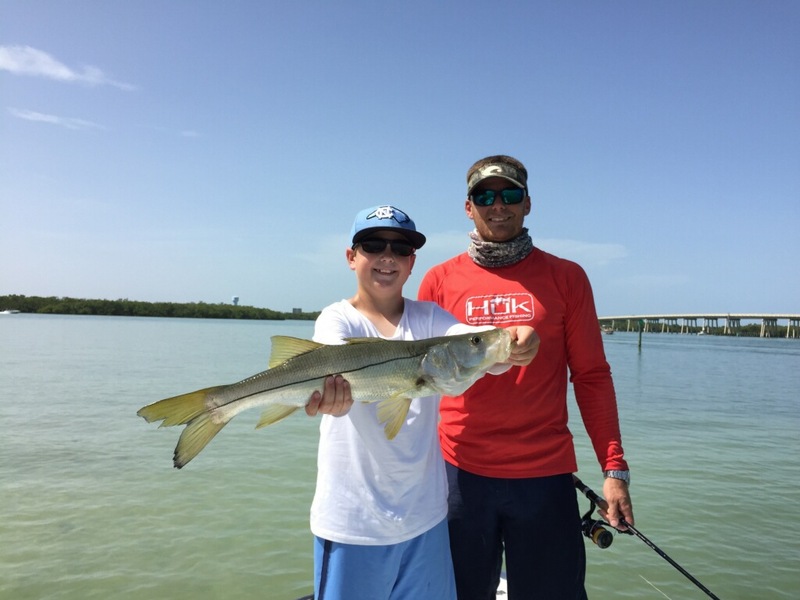 Most people will just be cruising around or docking the boat on the beach but for those of us guiding and even recreational fisherman there are some great opportunities to catch some great fish. Bait has been EXTREMELY hard to find so don’t expect to be able to go out on a whim and find it unless you have been out a lot and have stayed on them. If you can find threads they have been doing OK on the bigger fish like Tarpon and bigger snook. There is a massive hatch of small baits right now and everything has been feeding heavily on them so if you can find some that are just right meaning big enough to cast and put a 2/0 hook in they have been producing VERY well. Just yesterday my clients put over 25 snook in the boat on a 4hr trip all in the same hole! Most were on the small side but for two teenagers from NC they are a ton of fun! The moon is on a full pattern right now so the Snook will continue to be hungry, get out early and off the water early for your best chances. Once the midday heat is in full effect they have been shutting own. If it’s tarpon you’re after using Thread fins has worked the best. Everyone remember that this weekend can get crazy on the water so please BE CAREFUL and don’t drink and boat!